Over in Lapland a team of copper miners discover a frozen piece of a creature. The remains of the creature is soon taken to a university in Denmark where it remains frozen for investigation. During a long night at work one of the doctors accidentally leaves the freezer door open defrosting our reptilians remains. After the defrosting has happened the rest of the team discover that the creature is regenerating itself, so of course give it room to grow in a special tank on the university grounds. It is not long before the creature now known as Reptilicus escapes and causes havoc all over Denmark and the Baltic sea. Naturally the army get involved and despite the fact that the creature is known for regenerating itself, the army decide to keep blowing it up on many occasions throughout. They eventually get the creature under control but was all their efforts worth it. 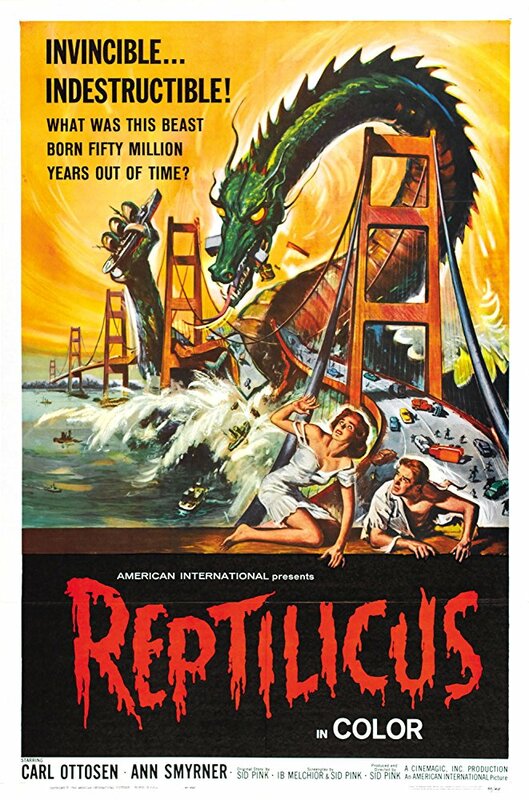 Cheesy films can be found all over the world but this Denmark/American sci-fi flick from the 1960's really takes it to another level. The acting....oh my the acting...while a concerted effort is made by all involved at times it is just too comical to take what they are saying serious. I was expecting a bit more from the creature itself, but once it has regenerated we are faced with a rod puppet that is seemingly controlled by a hamster wearing boxing gloves! It is all over the place and the creatures acid spewing makes it even less impressive. It is fair to say that this isn't the best creature film out there but the poster does its job on wanting you to watch the film.